A new U of T Scarborough study has identified "superstar" varieties of rice that can reduce fertilizer loss and cut down on environmental pollution in the process. 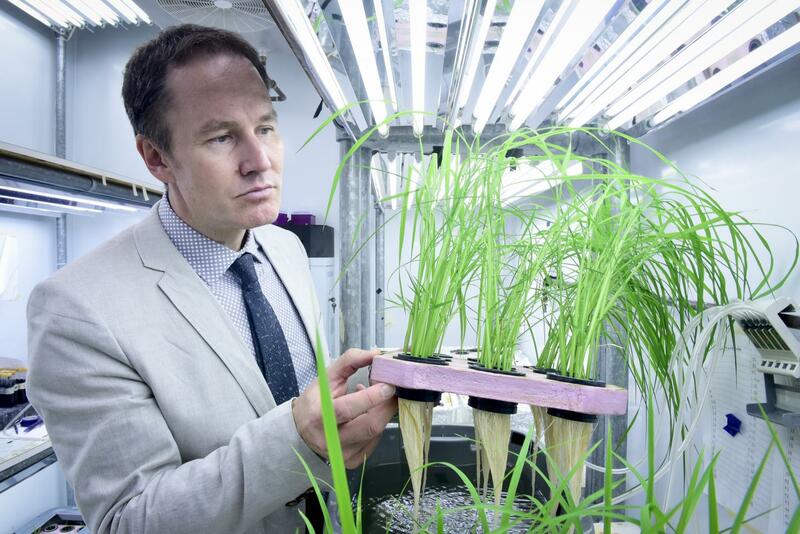 The study, authored by U of T Scarborough Professor Herbert Kronzucker in collaboration with a team at the Chinese Academy of Sciences, looked at 19 varieties of rice to see which ones were more efficient at using nitrogen. "We have this bucolic idea of agriculture – animals grazing or vast fields of majestic crops – but the global reality is it's one of the biggest drivers of environmental pollution and climate change," says Kronzucker. Nitrogen, when applied as fertilizer, is taken up inefficiently by most crops. In tropical rice fields, as much as 50 to 70 per cent can be lost. The problem is that nitrogen negatively impacts water quality by contaminating nearby watersheds or leaching into ground water. It's also a significant source of gases such as ammonia and nitrogen oxide, which are not only harmful to aquatic life but also a significant source of greenhouse gas emissions. While nitrogen is one of three main nutrients required for crops to grow, it also costs the most to produce, adds Kronzucker. "Anything we can do to reduce demand for nitrogen, both environmentally and for farmers in the developing world struggling to pay for it, is a significant contribution." Kronzucker's study for the first time identifies a novel class of chemicals produced and released by the roots of rice crops that directly influence the metabolism of soil microbes. They found that key microbial reactions that lead to an inefficiency in nitrogen capture can be significantly reduced in certain varieties of rice plants through the action of those specific chemicals released from root cells. One of the main reasons crops waste so much fertilizer is that they were bred that way. In the past fertilizers were relatively inexpensive to produce because fossil fuels were abundant and cheap. As a result, plant geneticists bred crops that responded to high fertilizer use regardless of how efficient they were at using nitrogen. "These inefficiencies used to be of little interest, but now, with fluctuating fuel prices and growing concerns over climate change, it's a much bigger issue," says Kronzucker, who is the Director of the Canadian Centre for World Hunger Research at U of T Scarborough. There are more than 120,000 varieties of rice stored at the germplasm bank at the International Rice Research Institute (IRRI) in the Philippines, but Kronzucker's team only focused on varieties that met important criteria. For one they concentrated only on Japonica (the rice used in sushi) and Indica, the world's most popular rice type commonly grown in China, India and Southeast Asia. The varieties also had to be currently grown by farmers, have a high yield potential, be disease and pest-resistant, grow to the right size and have strong enough roots to withstand monsoon-force winds. "They had to be proven in the field as viable options. It's not practical if a rice farmer isn't going to touch it," adds Kronzucker. "There's no reason a crop can't result in less pollution while also saving farmers money; the two aren't incompatible," says Kronzucker. "If we can produce more responsible plants that don't waste fertilizer needlessly, everyone wins."